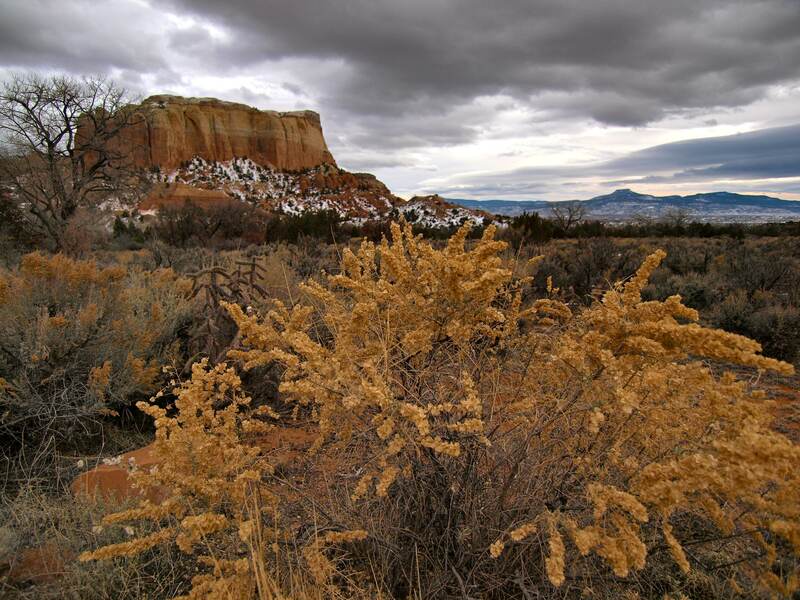 Ghost Ranch is one of my all-time favorite places on Earth. I can see why the artist Georgia O’Keefe fell in love with the place at first sight, and then rarely left. Whenever friends and family come to visit me in New Mexico, I take them to Ghost Ranch for a real, classic Southwest hike. In the past four years, I’ve hiked the Ranch’s three trails – Kitchen Mesa, Chimney Rock and Box Canyon – probably a dozen times. 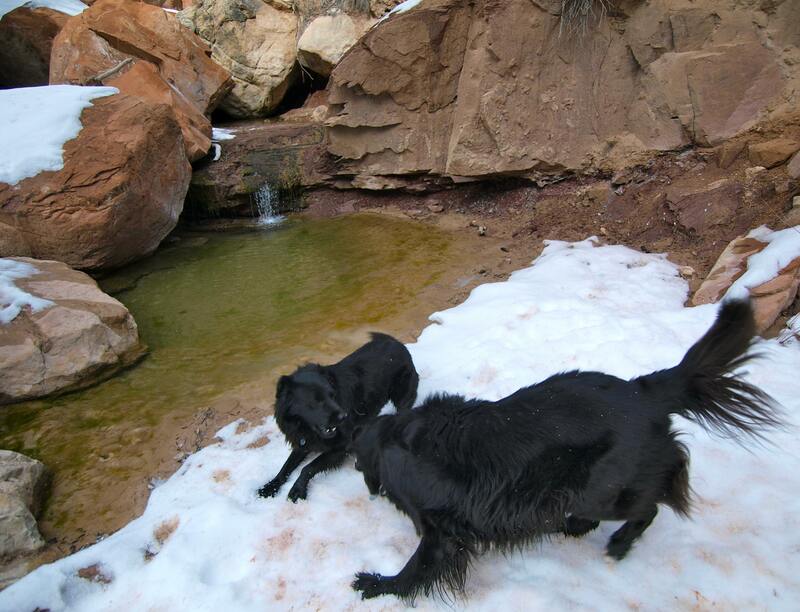 Box Canyon is best hiked in the winter, when the springs seeping out of the sheer canyon walls at the trail’s end freeze into massive icicles. 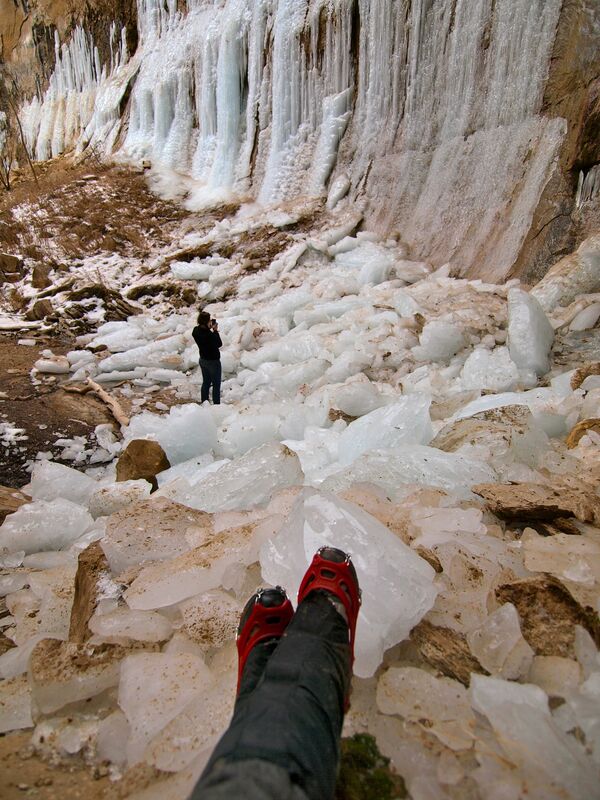 I’ve seen the icefall in the dead of winter, when the entire canyon is frozen and in early spring, when the ice has broken off the walls and shattered into jagged piles. On this trip the ice was somewhere in between: giant icicles still clung to the walls, but whole sections had already collapsed; the mark of a mild winter. While we sat in awe of the ice, every time we spoke, the canyon popped and cracked and occasionally shed a few more shards. One sharp piece bounced off my shoulder and I quickly moved farther away from the wall. So we didn’t go snowshoeing, but this hike was a great opportunity to try out my new Microspikes ice cleats, pictured in the top photo. Ice cleats are metal spikes that can be attached to the bottom of your hiking boots to give you extra traction on slippery surfaces. 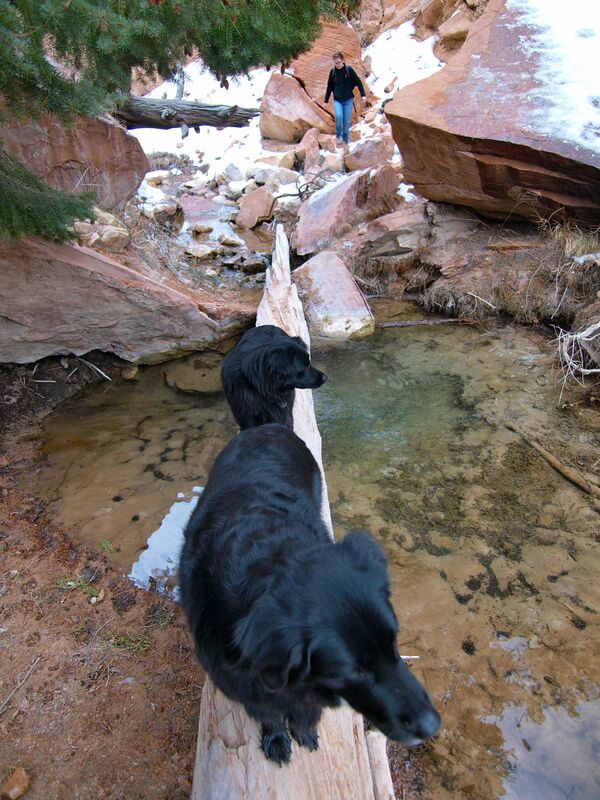 They’re useful whether you’re taking a 5-day backpacking trip in the Grand Canyon in winter (that’ll be me next month!) or walking down your driveway to get the mail. Wearing the Microspikes, I felt quite secure walking on everything from crunchy snow to sheer ice. I don’t quite trust the chain links not to break when crossing sections of bare rock, but they’re easy to get on and off. So far, I give the Microspikes two thumbs up!